.VHD and .VHDX: These files are virtual disks that hold the current virtual disk data, including partitions and file systems. .VSV: This file contains VM’s saved state. The BIN file created in the virtual machine folder of the virtual machine is equal to the size of the memory of the virtual machine and is a placeholder to save the virtual machine state in the event that the Hyper-V host shut down. The BIN file contains the memory of a VM and is located inside the GUID folder. If the VM in powered off state, there will be no BIN file present. This file is the equal to the size of the VM’s memory provisioning in Hyper-V Manger. In Windows Server 2008 and Windows Server 2008 R2 – starting a virtual machine would result in Hyper-V creating a .BIN file which matched the size of the memory assigned to the virtual machine. Microsoft did this to ensure that we always had enough disk space available to create a saved state (which is particularly critical if the physical computer is shutting down – and the virtual machine is configure to save state when the physical computer shuts down). The BIN file is simply idle while the virtual machine is powered on; it is pre-allocated so that its space is guaranteed to be available if needed and for quicker response to a save action. However – many people did not like to see their disk space being “wasted” like this.., as BIN file is idle during running state. To address this, since Windows “2012” Microsoft made a simple change: Hyper-V only pre-create the .BIN file if you choose “Save the virtual machine state” as the Automatic Stop Action for the virtual machine. If you choose “Turn off the virtual machine or Shut down the guest operating system”, BIN file will not create with equal size of RAM. It is still possible to save the state manually as long as there is enough room for the file. Above Automatic Stop Action setting in only applicable when Physical computer shutdown. By default, all virtual machines have an Automatic Stop Action of Save, which means the state of the virtual machine saved to disk. However, the best practice is once Integration Services are enabled the Automatic Stop Action should be changed to “Shut down the guest operating system”, which performs a clean shutdown and no longer needs the BIN file to save the memory content to. Keeping BIN file is not recommended in a cluster environment as VM’s were configured in High Availability, in case of Physical computer shutdown, VM will failover to another anode hence there is no advantage of keeping BIN file. Consider choosing BIN file if Hyper-v Servers are not in cluster (standalone) and no constraints with storage space. 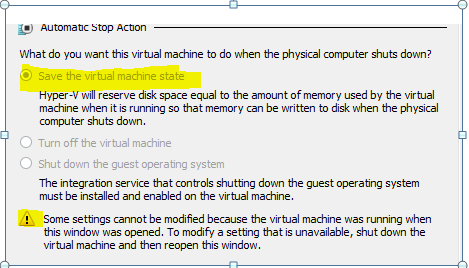 VM move into saved state only when Hyper-v Host is gracefully shutdown and VM will not move to save state in case Hyper-v host is unexpected shutdown/restart.